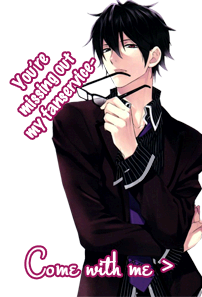 So, just share with us : Who Took Your Otome Virginity ? Do you even remember ? Saizo Kirigakure from Ninja Love ! hmm... I wonder if that counts since it was kind of "pure-innocent confession ending". So... you're still an Otome-virgin ? Mwehehe I like this topic! Hmmmmmm let me think... Well it's not like I have to think for long. I think it was Blood Dupre afterall. From Heart no Kuni no Alice. As for otome games, I clearly remember it being, go figure, Gardis from The Second Reproduction. Before my phone, most things I played were innocent enough. Ah, Saizo~ My second pixel husband who had his way with "me" was Munenori, only because he was a limited time route in the GREE version, which is due to die in a couple months. I'm pretty sure my otome virginity went to Peter White from the original Heart no Kuni no Alice game on the PC. @Ace of Heart "I'm pretty sure..."
You can tell us about your Bishoujo otome virginity as well !! @fairth Hehe, there are more implications there than I intended XD. I remember trying to go for Radu Draculair. I stumbled across images can't remember where but first time I played the game I got his good ending first try. Anyway I really wanted to do Ukyo's but you can't do his without the other four. ....I play a decent amount of Visual Novels on my PSP. Finishing them however is a different story. I am amused how multiple people in this thread do not have their minds in the gutter after reading the topic title. OMFG LIKE, OMG!! My first one was Saizo too!!! *0* Like, I cried rivers of tears the first time I played his route. I thought that I wouldn't like him so much, but I ended up loving him!! That's so embarrassing... Every time he acted like a jerk (Almost every time in the beginning, but...) , I would lock my phone and would pout for like... 5 minutes while convincing myself that he was such and idiot and who would ever like him! Right after I would unlock my phone and throw myself at him again. Alas, otome games are often bad about that, and there is usually AT LEAST one jerk who does/says degrading things to the MC without hesitation. Jerks here, there, everywhere~~~ And that is their way of showing they looooove you. Did you purchase that spinoff? I remember all the hype over it in the GREE version, but I did not bother. Can't recall if it is open in the +Version, but if it was I would likely have attacked it with Tapjoy already. Still waiting for Momo's route HALF A YEAR after their annoucement. And yeah! There's always the DAMN jerk, and he always steals me first... Gaaah! Whyyyyy? The last MAJ for the non-gree version had all the spin-off purchasable, but I think it's a bit too espansive to pay the same amount for the spin offs and the main stories (around 4euros), when the stories are shorter. I've been playing BMP Party, and it's confusing my mind SO HARD. Because, I just finished Joshua's main, and the stories change SO much! (They're the gree version actually...) But I never finished it on gree ver. Because everything was so unequal... And now there're a lot of opportunities, and they're great! The events are so great too!! I just love'em!! No one else lost it to horrendous games on newgrounds when they were 12?